With Ezio and Altair's story behind us, Ubisoft has moved into a more recognizable time period which features new gameplay mechanics and motivations to lead both players and Desmond to continue working inside the Animus. Assassin's Creed III features a new assassin named Ratonhnhaké:ton, but you can simply call him Connor. As Desmond you will venture around the world looking for special items to help stop the Templars, and Connor's story focuses on stopping templars as well and protecting historic political leaders who shaped the beginnings of our independence. Ubisoft does enough new things to keep veterans of the series invested in the story, while making the game more accessible to new players who may have not taken a leap into these titles. The element that I immediately noticed in AC3 were the game's visuals. Now running on the new 'Anvil' engine, the game features more diverse NPCs on screen than ever before, accompanied by great environmental objects such as trees, boats, wildlife, and realistic weather effects. I don't know what the exact frame rate is, but the game always ran smoothly with my time with it. Throughout the story in the game, many historic battles from our past are depicted in grand form, with hundreds of soldiers viewable with battle effects surrounding the chaos. From the musket firing, yells of wounded soldiers, and the growling of nearby bears, Assassin's Creed III does a great job of immersing you into the mid 1700's time period with tremendous detail. As with past Assassin Creed games, the story is mainly focused on the various ancestors of Desmond Miles, but this time there are more playable sequences that have you controlling Desmond in the modern age of 2012. Both viewpoints are equally engaging and it's nice to play as Desmond and traverse around his current setting utilizing moves learned from his respected ancestors, which Connor has plenty of. The half English and Native american raised Connor can easily traverse through the forest areas with great ease and very swiftly. You'll be able to leap from tree to tree, and give yourself a nice area to attack unsuspecting enemies who may await below you. Add this factor alongside the weapons like the bow and rope, and you'll really be able to down any enemy who stands in your way. The controls in Assassin's Creed III have gotten more simpler, which makes the game more accessible to everyone. Performing counters now only requires the use of one button, and attacking down to two which either uses a short or long ranged item like the bow, pistol, blades, or hatchet. Tougher enemies that you face in the game can't really be countered, and for these guys you'll need to break their defense which is performed by one button as well. Traversing the environment is also a bit more simpler. On Xbox 360, instead of holding the RT and A button to get around, you can simply just hold RT, with A used when you wish to jump or make tougher leaps. 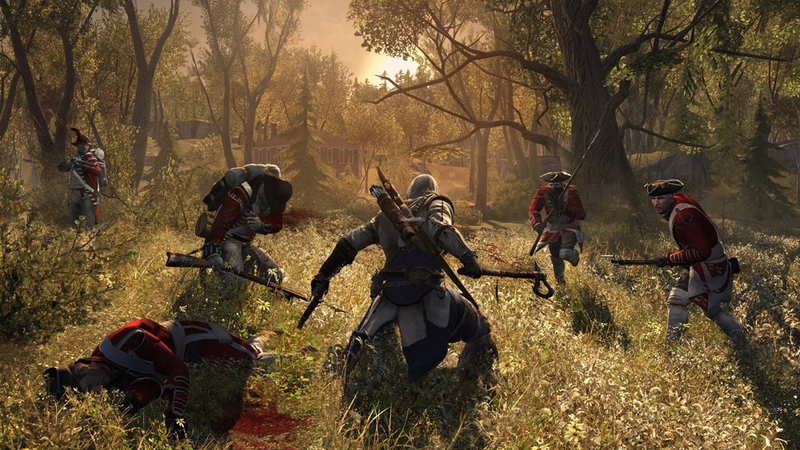 No one should have a problem playing Assassin's Creed III. 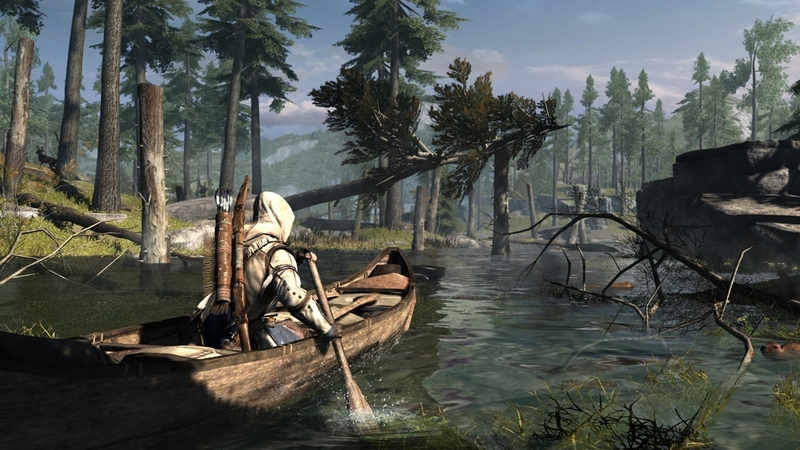 Some of the new gameplay elements that AC3 provides includes Ship battles and hunting. At certain points in the game, you're tasked with taking on hostile ships who aim to sink you, so you'll have to act swiftly. You can alter your speed by changing the ship from half and full sail mode, while maintaining control of the ship. It's all handled fairly easy, with most of the focus on staying in the correct direction of targets. 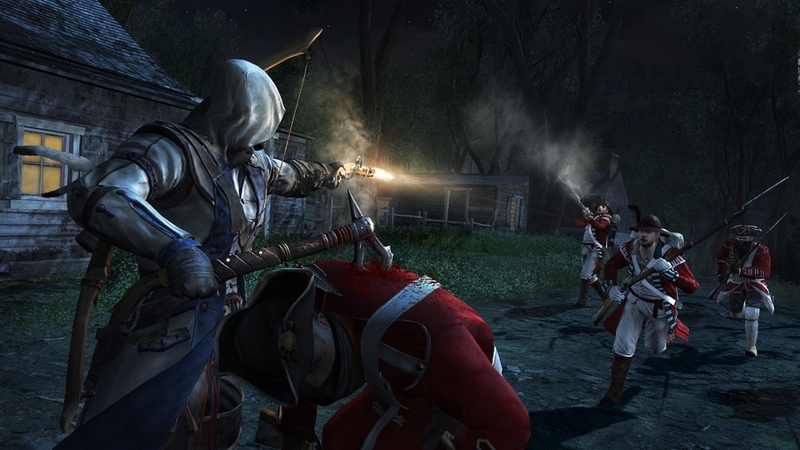 Hunting becomes available in the game fairly quickly after getting control of Connor. It is initially done for tutorial reasons, but later becomes used a mean to build up currency and trading purposes. Most animals that you can hunt require a bit of tracking, which usually boils down to finding and analyzing clues left by the animals. Bigger ones, such as a wolf or bear don't require as much investigation since they will try and attack upon seeing you, but they can be dispatched with quick button presses. It's a nice feature to check out if you want to build up some currency to purchase new items for Connor. Multiplayer is back in this game and although gameplay wise it hasn't changed too much, there is a new co-op mode titled 'Wolf Pack' to check out which can allow for up to four friends and players to see how quickly and varied they can rack up assassinations. Multiplayer will once again require a Uplay pass which comes with a new copy of the game and players who borrow or rent the game can play to a certain level limit. The ranking system is still in effect, so whether in co-op mode or versus multiplayer, you can level up and unlock new items for your character of choice. 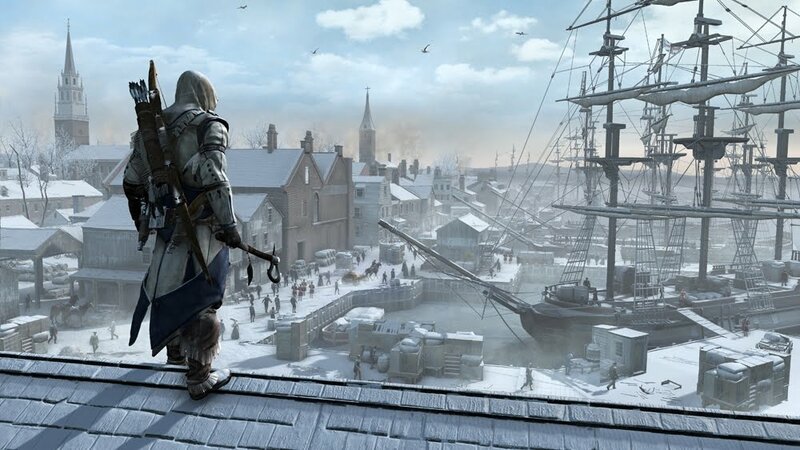 Assassins Creed III raises the bar high for future AC and other action-adventure titles. There are a few technical glitches here and there, but nothing severe enough to deter from the overall experience. If you decide to give the game a try, you'll be glad that you did. "The American Colonies, 1775. It’s a time of civil unrest and political upheaval in the Americas. As a Native American Assassin fights to protect his land and his people he will ignite the flames of a young nation’s revolution. 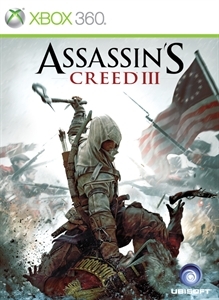 In Assassin’s Creed® III, eliminate your enemies with an array of new weapons including guns, bows, tomahawks, and trusty hidden blades."